From 5th May 1999 you may be required to do the reverse park exercise as a reversing into a parking bay at the driving test car park. Reverse parking into a bay must be carried out at the test centre at the start or end of the test, when there is a car park at the test centre. So if your test centre does not have a car park, you will NOT be asked to do this exercise. · Making proper use of the accelerator, clutch, brakes and steering. · Without crossing the white bay marking. · Are aware of other road users. · Keep looking all around throughout the manoeuvre. The layout below shows a parking bay. You can choose whether to reverse from the right or the left. When practicing you will be able to see which way suits you best. · Look at the layout markings and the size of the space available. · Use your mirrors and signal if necessary. · Check your position and keep your speed down. · Use effective all-round observation. · Look out for pedestrians. · Reverse and park as neatly as possible, with your wheels straight. 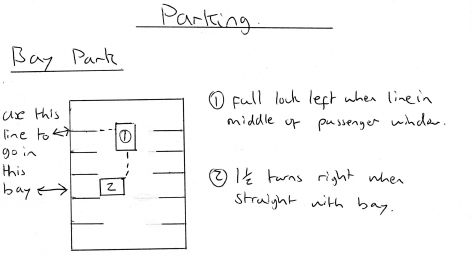 · Make sure that your vehicle is neatly parked between the layout markings in the bay. 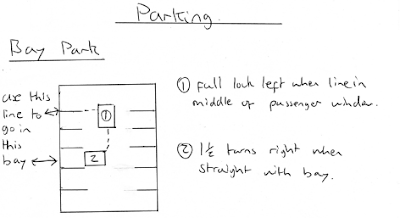 You should be aware that if any "shunting" (moving forwards then back again) is needed to correct your ultimate position between the lines, then it must be done BEFORE your car enters the bay. Beware: they're really picky on this one! I've seen people fail for having just half of one tyre over a bay line. Critics say that if the Examiner has to open the door & lean out to check the line, how the heck is an inexperienced driver supposed to be able to judge!!! It is OK for you to move a mirror before starting the manoeuvre, but this could cause a problem especially if you become too reliant on the mirror and forget to use all round observations. When doing this manoeuvre you have to reverse using all round observations and occasional quick glances at the side mirror for checking your position. If lots of practice and encouragement fails to get you confidently into a bay then sometimes we would suggest moving the mirror, but keep checking all round and it is important that the mirror is returned to it's usual setting before driving off. That's it! If you have any questions then leave a comment and I'll get back to you! Awesome parking illustration, I truly like it very much. Thanks for sharing. We're glad you found this useful :-) thanks for leaving feeback.